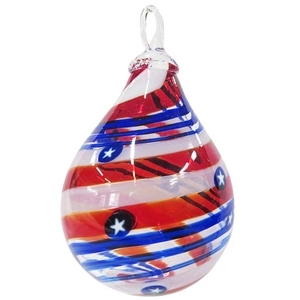 This is an artisan series raindrop shaped ornament handmade by artists at the Glass Eye Studio in Seattle, Washington. The glass is recycled and contains ash from the 1980 Mt. St. Helen's eruption. This piece features red, white, and blue stripes and white stars. Its diameter is approximately 2 1/2" and 4" tall. Includes a stand.